Bull flag pattern of forex trading consists of two parallel lines, one top and one bottom line, on the top of a long rally, creating a flag shape. Both top and bottom lines are falling to the right ,and hold support and resistance points. On the falling tops resistance points are exist and on the bottom line support points are exist. To draw a bull flag, two highs and two lows are must. The break out across the falling top is the signal of bullish rally. Bull flag pattern is widely used chart pattern in forex trading. 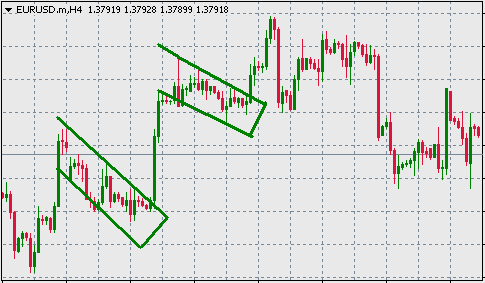 This formation is found immediately after a big rally of a currency pair.